Mix sweetened condensed milk, whipped topping, and vanilla extract together in a bowl. 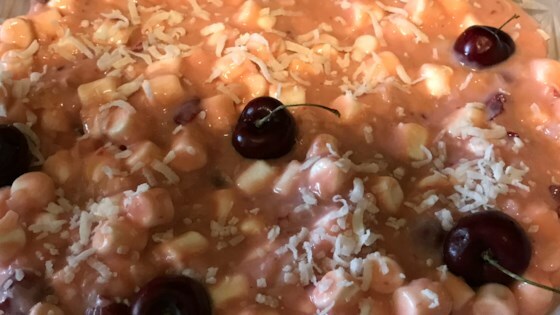 Fold cherry pie filling, pineapple, coconut, pecans, and marshmallows into the condensed milk mixture. Cover bowl and refrigerate 8 hours or overnight. Mix well before serving. Unfortunately I did not like this recipe. It had a metal can taste from the sweetened condensed milk & cherry filling. I liked how easy it was, but I just couldn't get past that canned taste. Took this to a bible study & a luncheon and every loved it!! I think I would have used fresh fruit verses canned. But it was super fast to make.